Support for corporate political disclosure sponsored by the Center for Political Accountability’s resolution jumped among the largest mutual funds in 2018. An analysis by Fund Votes found support moved to 53%, up from 45% in 2017. This 8% increase was the largest since CPA began tracking institutional investor votes on its resolution in 2008. Of the 46 largest asset managers, 12 supported 100 percent of the political spending resolutions and 11 supported none. Twenty-five of the 46 groups increased their support from 2017 to 2018, while nine decreased support. According to CPA president Bruce Freed. This upswing reflects mutual fund recognition of the importance of companies adopting political disclosure and accountability to manage heightened risk. We are very pleased to see this trend. If there is one disappointment, it is that some of the largest institutional investors, Vanguard, Fidelity and BlackRock in particular, continue to refuse to recognize the importance of –and cast their proxies for –corporate political disclosure and accountability. Fortunately, this is not the case with other leading mutual funds. Five groups—BNY Mellon, Janus Henderson, Eaton Vance, PIMCO and Lazard—increased their support by over 40 percentage points. Average shareholder support reached a record level in ­­2018, at 34%, up from under 30% last year. Contrary to this upward trend, AMG and State Street decreased their support for the resolution. Fund Votes examined 115 fund groups’ votes across the 2017 and 2018 proxy seasons. As in previous years, the study sought to profile the spectrum of voting patterns across a wide range of funds managed by large asset managers as well as by smaller, SRI-oriented managers. The 115 fund groups identified were those indexed in the Fund Votes database that had cast votes on at least 5 resolutions in each of the two proxy seasons. Their total assets under management, according to Morningstar® fund data, amount to over $14 trillion, of which almost $5.5 trillion is invested in the U.S. securities market. Of the 115 fund groups studied, 60 increased their support for political spending disclosure resolutions between 2017 and 2018, compared to only 23 fund groups that decreased such support. Among the 45 largest asset managers, 25 groups increased support while nine decreased such support. In 2018, 53 fund groups supported at least three-quarters of the resolutions voted upon, compared with 40 fund groups in 2017. Only 23 groups failed to support a single political spending disclosure resolution in 2018, compared with 25 in 2017. 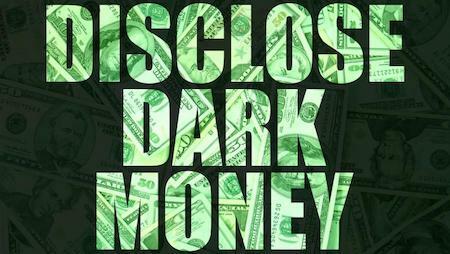 Thirty-four fund groups, mostly SRI asset managers, supported all election spending disclosure resolutions in 2018. 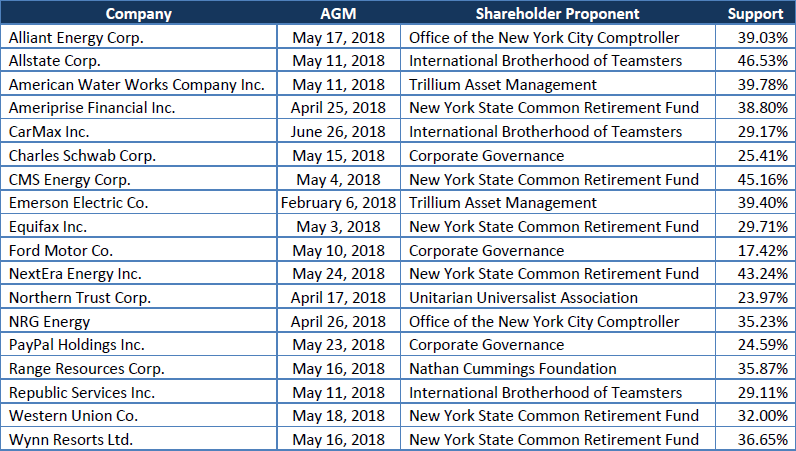 Mutual funds looking to update their proxy voting policies with more specific guidance on disclosure and oversight of corporate election spending may draw on Appendix 2 of The Conference Board’s Handbook on Corporate Political Activity, in which sample proxy voting guidelines are provided. In addition, CPA’s one-page summary on the key elements of meaningful corporate political disclosure provides concise guidance to proxy voters as they try to determine where the gaps may exist in a company’s policies and disclosure. CPA is a non-profit, non-partisan organization created in November 2003 to bring transparency and accountability to political spending. To learn more, click on the Center for Political Accountability. Publisher: I see support for corporate political disclosure proposals by Corporate Governance (CorpGov.net) were low. I do what I can to push those numbers up this year but I expect it was more the type of company. I see Ford came in the lowest. Yes, that happens when a company has dual-class shares.